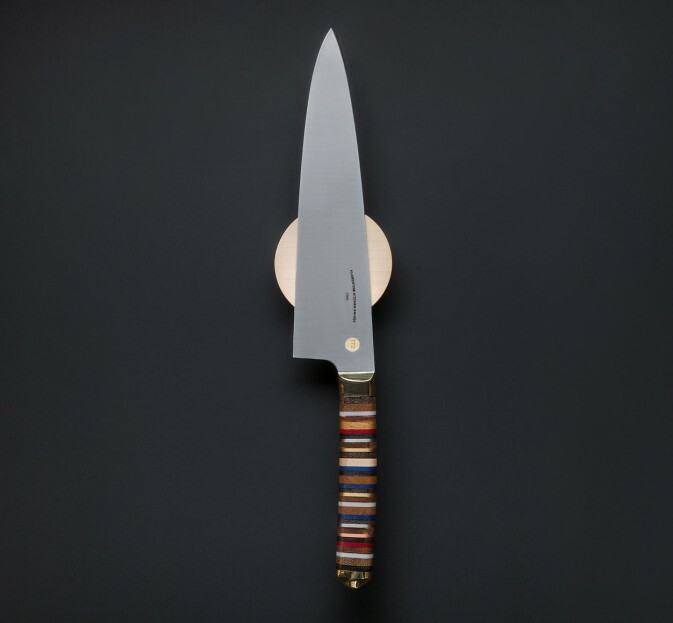 Limited to 200 pieces, this is The Chef's Knife with mixed pattern handle from Florentine Kitchen Knives' 2016 collection. 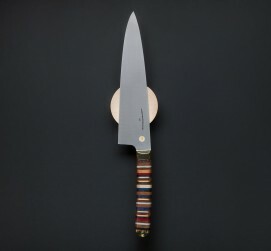 With new geometry and fit and finish, Tomer Botner's Florentine Two lineup features the highly regarded Swedith Sandvik 14c28n stainless steel, cryogenically treated and hardened to 61HRC, alongside sand casted, hand polished brass bolsters and pommels. 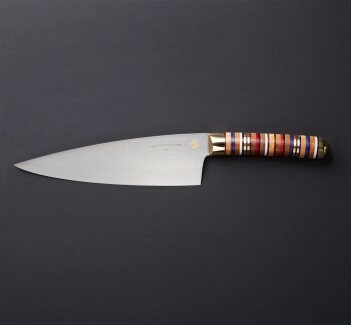 The handles, each unique and assembled by hand one by one, contain discs of brass, copper and steel, various tropical woods including tauari, garapa, kambala and hard maple, brown, black and natural cow leather, and red, white and blue micarta. Each piece is numbered and comes in a black presentation box. 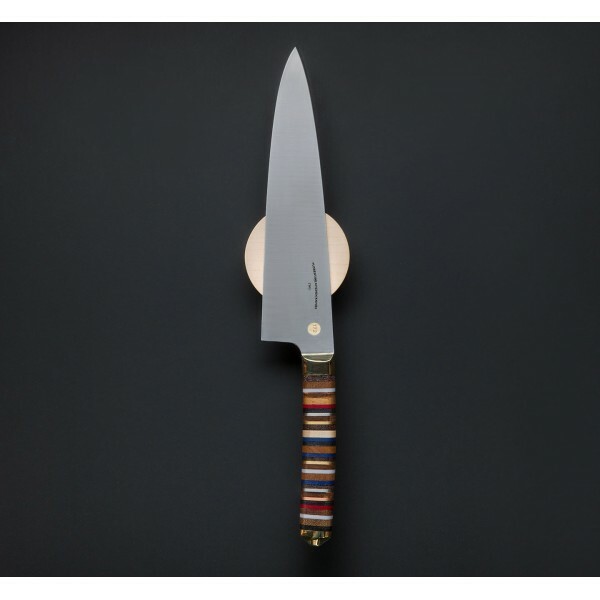 Sandvik 14c28n stainless steel, sand casted and hand polished brass bolster and pommel, and mixed discs of brass, copper, steel, red/white/blue micarta, assorted woods and black/brown/tan leather. 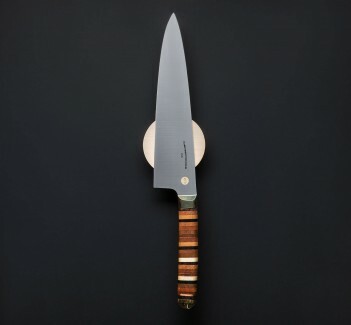 I had originally bought the FKK knives to use at home, but I liked them so much that I bring them to work with me everyday. 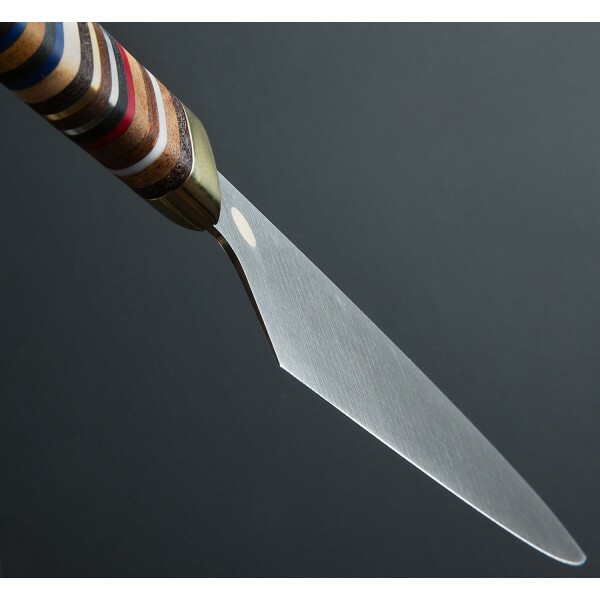 They have an amazing feel and they make every cut buttery smooth and retains a beautiful edge. It certainly provides more excitement to cutting the same things five days a week!